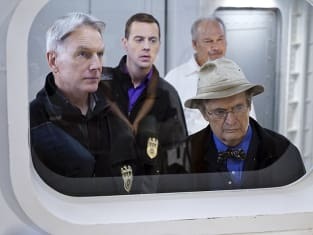 TV Fanatic panelists Christine Orlando, David Taylor, Kathleen Wiedel and Douglas Wolfe dive in to talk about Ducky, Tony's cryptic comment and more on this week's NCIS Round Table. Why not join them and let us know your comments on this exceptional episode? Christine: Best Valentine’s Day ever! David: Red is the color of my liquid cocaine. Kathleen: Liars, cheats, and murderers – Happy Valentine's Day! Tim suggested that Tony might prefer to live alone, to which Tony replied “We all have to live with our decisions, Tim”. What do you think he meant? Christine: Tony has a lot to process this Valentine’s Day. He and Zoe are over. Ziva is long gone. I think he really loved Jeanne Benoit but that relationship was for an undercover mission and had no future. Tony’s not getting any younger. It will be interesting to see what choices he makes, both personal and professional, moving forward. David: I'm with Christine. I think Tony was coming to grips with the mistakes he's made in his past relationships, and maybe that'll be the reason he leaves. He's plateaued personally and maybe professionally so the time seems right to make a change. Kathleen: Tony was remarkably introspective this week, wasn't he? I like David's suggestion that this self-analysis will lead to Tony's departure; he's really dedicated his whole life to the team for over thirteen years now, and it's really consumed him. He's starting to ask himself what he has to show for it all. Maybe he will leave the agency, maybe he will finally choose to lead a team of his own. Either way, it would mean he wouldn't be sitting at that same desk in another thirteen years. Doug: I thought that statement was one of deep regret. It makes me think maybe he's re-examining his choices and doesn't think too highly of himself because of them. One thing's for sure: it sure put a damper on the levity that was taking place before things got serious. I think you guys are onto something though. This may very well be a foreshadowing of his decision to leave the team and strike out on his own. What are your thoughts on the case of the week? Christine: I enjoyed it. I liked how Ducky tried to get what he could from a body he couldn’t touch and how that was a challenge for everyone involved. It’s nice to see that they can still put a new spin on the case of the week, even after so many seasons. There were also moments that made me laugh such as Gibbs eating cherry jello and the suspect who was having an affair but swore she’d never divorce her husband because her marriage was sacred. LOL! David: Sacred... because she was raised Catholic, no less. I guess she was absent from Catechism class when they taught the "no coveting thy neighbor's spouse" thing. I liked this one too; it presented the team with a physical barrier (and how) to solving a case, not just an administrative or political one. Kathleen: "Remote autopsy," Ducky? Nice one! And I snickered with Christine and David over the "marriage is sacred" thing, too. I think that woman irked Gibbs, who has his own personal experience with cheating spouses. Doug: I've said it before: ever since she-who-will-not-be-named left the show, the writers have really stepped up their game. They've given us so many marvelously unique episodes. This one, involving a remote autopsy performed by Ducky, with three suspects acting as his tools, was just way over the top and therefore a thing of beauty. This is how you write a compelling show! Christine: Ducky walking the divers through a preliminary autopsy. He was just so matter-of-fact about it. So very Ducky that I couldn’t help but smile. I also liked Maya Stojan as the killer. I’ve really enjoyed her on Castle and Agents of S.H.I.E.L.D and it was fun to see her on NCIS, I just wish it were for more than one episode. David: Gibbs nailing the smarmy lawyer, complete with cherry gelatin dessert. I do so love when a repugnant character gets what he deserves. Frankly, I was hoping he was involved. Kathleen: Heh. 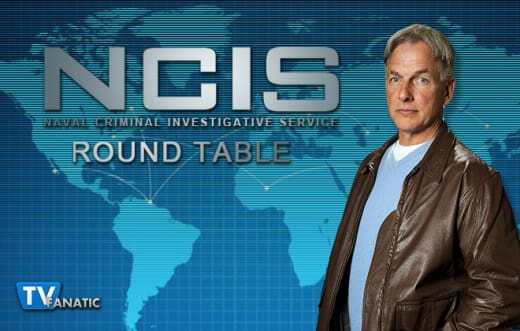 As I recall, seven of Gibbs's Rules involve lawyers, including Rule 13: "Never, ever involve lawyers." That gelatin scene was great. Doug: I'm with David and Kathleen. You knew, as soon as you saw the unconcerned look on Gibbs' face that he had the case wrapped up with a bow. I loved his takedown of the smarmy lawyer. Was there anything that didn’t work? Christine: Tofu hearts! That definitely doesn’t work. David: That... and a corpse left on a bunk for 4 days? Didn't it start to smell and decompose? Oh, and how did that metallic squid-like thing figure in all this? Was that the real mission, or was that a smokescreen too? Kathleen: If the caches filled with water, wouldn't there not be enough buoyancy to rise to the surface? Or was I missing something there? Doug: I didn't do well with physics in school so that the buoyancy thing didn't bother me. I was a little worried about the evidence quandary though, and whether or not Ducky's work would go to waste, given the lawyer's statements. But I got over it quickly because the case was so damned interesting. Maria: I would never leave my husband. I was raised Catholic, Agent Gibbs. My marriage was sacred. Gibbs: You've got a funny way of showing it. Permalink: You've got a funny way of showing it. Gibbs: You know, there's a small percentage of people who can't eat anything processed red. Allergies. Gives them rashes, Meredith. Like that rash you have right there, Meredith. You must have touched something red recently, huh? Like a vial of red liquid cocaine? Found those inside the PPAs your divers positioned on the ocean floor. There's 200 of them. That's a whole lot of drug money. Grossman: It's inadmissible garbage. Doesn't make any sense. Where would Meredith get narcotics like that? Gibbs: She didn't. She had a partner, who's being arrested as we speak. In 2010, you represented the Suarez Cartel. Their signature product was liquid cocaine. Last month you had a meeting in Cartagena. We've been tracking your pre-positioned asset. Last night it was called to the surface and loaded onto a Columbian trailer. The DEA raided it. Gibbs: No, Jerry. You shut up. Permalink: No, Jerry. You shut up.